The year got off to a rather slow start, was dominated by the ‘Beast from the East’ and there were few wildlife highlights in January and February. I spent a lot of time climbing with Alexander, saw the Skids at Preston Guild Hall with Rocket, did a few hikes up Pendle and produced the first in a new series of pin badges for Spurn Bird Observatory with Steve Williams, the 2016 Siberian Accentor. A drake Common Scoter at Barrow Lower Lodge caused me to dust the cobwebs off the 500 for what was most local birders’ second species of scoter on this tiny little pond next to the A59 McDonald’s. Jon Hornbuckle’s passing away in February was sad, he was a friend and a maverick birding legend. My first tour of the year was in March, Baja California, preceded by a few days in SoCal out of San Diego. I had long wanted to visit Joshua Tree National Park and it more than lived up to expectations, including a few nice new ABA birds like Le Conte’s Thrasher. A Thick-billed Kingbird in San Diego itself was very welcome as were lots of gorgeous Phainopeplas. I even stayed in the same motel at Idyllwild in the San Jacinto Mountains that I had done 27 years earlier, it looked like nothing had changed there in the meantime. The Baja cruise itself down the west coast and up into the Sea of Cortez aboard MV Searcher was unforgettable with numerous cetacean encounters, including Blue, Great and Dwarf Sperm Whales, breaching Humpback Whales, Fin and Short-finned Pilot Whales not to mention the Gray Whales, whose calves stuck their heads into our motorized skiffs. Captain Art Taylor and his wonderful crew took whale spotting to another level! Fab-u-lous! A return to Israel, also after almost 30 years, followed in April. The birding on the migration flyway is still as good as ever although the birding sites have changed somewhat, some have been destroyed completely but some new ones have emerged. It was also nice to stay in hotels instead of the infamous Max’s Hostel or sleeping on North Beach. Highlights for me were the Sinai Rosefinches, Hooded Wheatears, a crazy tame Corn Crake, my first WP Crested Honey Buzzard, a flock of a thousand white pelicans over Agamon Hula, point blank Crowned and Pin-tailed Sandgrouse and song-flighting Syrian Serins as well as Eastern Steppe Festoon butterflies on Mount Hermon with some great Israeli birding friends. The first Stocks Spring Birdwatch got what we hope will be an annual event off to a start and the walled garden big sit produced 76 species over the course of the day. Another quiet spell of falling to bits included seeing the recently colonized Purple Emperor at one of my old haunts Chicksands with Stuart Pittman and led up to my fourth visit to Svalbard and another cruise aboard SV Noorderlicht. We got all the way around the island of Spitsbergen this time with the sea ice far away to the north above 81 degrees but still managed to see 14 Polar Bears, including my first close encounter on land. The birding highlights were a flock of 14 Sabine’s Gulls (some of which were in courtship for some reason!) at my favourite spot on Spitsbergen and Ivory Gulls in Hornsund. 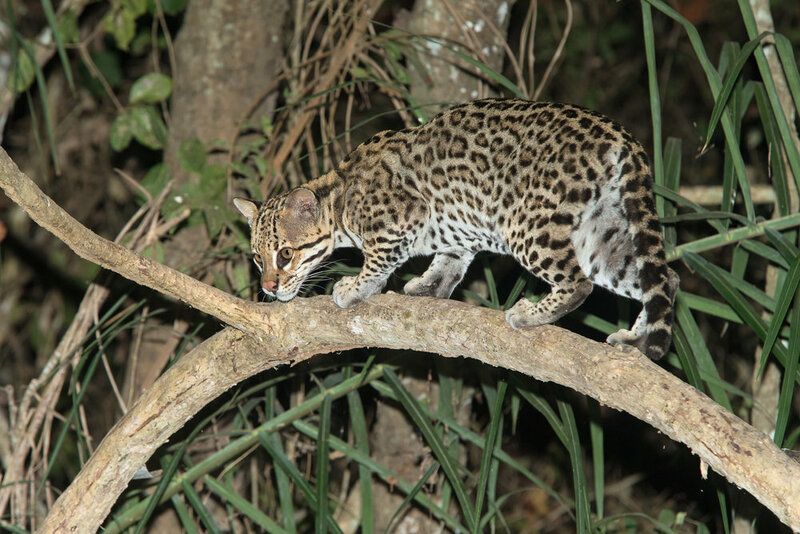 After a gap of only a day I was off again, this time to Brazil’s Pantanal where the Jaguar activity was off the scale at 33 sightings in only 10 boat trips on the Rio Cuiabá and included some nice photographic encounters. However, my personal highlights were Ocelot at the Santa Teresa ‘outdoor photo studio’ and the touching distance habituated Giant Anteater at Pouso Alegre. The second in the SBO pin badge series, Ivory Gull was ready for the Bird Fair and in September Alexander entered his first climbing comp at one year under the minimum age, three years under the top of his age category and came fifth, which was a big surprise to everyone. He’s got the power! In September a return to Madagascar, also with Wild Images, was successful and my personal highlights were tree-climbing Fosas, Crowned Lemurs and Golden-crowned Sifakas and Collared Nightjars to name a few. The roads (if you can still call them that) in the north were the worst I’ve ever travelled on, taking 12 hours to cover a very bumpy 190km. This was set to be my last of the year and I’d even completed my usual highlights collage but being sent on a cruise to The Falklands, South Georgia and Antarctica at 24 hours notice in sad circumstances was something of a shock. My seventh and final continent (or eighth if you count Madagascar) was special, as were the endless seabirds, particularly Light-mantled Sooty Albatross, penguins, Rufous-chested Dotterel on The Falkland Islands and in particular South Georgia. Its King Penguin colonies (the Serengeti of the South as Attenborough called them) are one of the wildlife wonders of the world and easily a match for Svalbard. Everything in the South Atlantic is bigger, more impressive, more remote and more dangerous. It is simply awe-inspiring. This trip also meant that I spent 50 days at sea this year and coped with some very rough conditions better than I have done before. December was another East Lancs washout and was mostly spent indoors at climbing gyms with my little superstar. As time goes by I enjoy watching him do things more than doing them myself. I thought it would be longer before he was better at things than me but in the end it was only six years. Looking at another busy year ahead I’m still falling to bits but going for it more than ever. Finally I should say a big thank you to everyone who keep things going while I am swanning around, Jen, Nigel, Pauline and Pete at Birdquest/Wild Images and my partner Évi, who I abandon on a regular basis. Also a big thank you to our local guides, ground agents and drivers who looked after so well this year. The southeasterly tradewind buffeted our little ATR turbo prop aircraft on its approach to the tiny airport at Antsirinana (formerly Diego Suarez, hence the disturbing airport code on our baggage ‘DIE’) to the extent that our pilot had to abort our first landing attempt. We were thrown about a bit coming in from the northwest and just before we reached the runway he turned on the gas again and lifted the nose of the plane away from our target, before circling the large bay to the north and lining up properly next time for a text book landing into a strong headwind. There was some cheering from the passenger cabin when we finally touched down and drew to a halt. Outside we could see palms bent over in the wind and a few folks gathered outside the airport terminal and holding on to our hats we hurried inside to pick up bags and meet our 4WD drivers for the next few days. There are numerous adverts for kite surfing in the airport terminal, a clue to the reliability of strong winds here in northern Madagascar at this time of year. At least it was a warm wind, a bit like a hair dryer in fact. However, this was only the first minor hurdle involved in getting to the remote dry deciduous forests of northeastern Madagascar, which are home to some very special lemurs we were hoping to photograph. Golden-crowned Sifakas at Tattersalli Camp, Daraina. Over-grazed and eroded cleared hillsides contrasting with pristine dry deciduous forest. Next came a 12.5 hours road journey. The road south from Antsirinana to Anbilobe is part of the main arterial route from the north of Madagascar to the capital Antananarivo but not that you can tell now. Along with the rest of northeast Madagascar it was battered in March earlier this year by Tropical Storm Eliakim, the system, which was also responsible for much loss of life as well as the destruction of 30% of the country’s precious vanilla crop. There is now only a thin strip of tarmac in places and deep ruts to either side of it as well as most bridges down and diverted, which made our progress very slow. If that wasn’t bad enough, the unmetalled 100km section from Anvilobe to Daraina had been mostly destroyed to the point that there were at least one million detours around impassable sections, administered by locals with small barriers demanding a toll for passage on the new route they had cut by hand through the adjacent bush in many cases. We saw one feeble attempt at road repairs taking place in one location, otherwise the road, if you can still call it that had been abandoned by the authorities. The result was that we could only average 16kmph on this section for hours on end and we arrived at our destination, the conservation NGO Fanamby’s Tattersalli Camp at Daraina well after midnight. The same journey had taken ‘only’ nine hours last autumn and the ride was not nearly as bumpy as this time. We had to grip the handles of the 4WDs constantly lest we be hurled around inside like in a washing machine. Fortunately we did not have anyone with a spinal condition and we were all quite pragmatic about the adventure we had embarked on. Our spirits were raised when we discovered that our wonderful camp hosts had waited up for us and served us an evening meal after 1am, the first time I have had two evening meals in the same day on a tour! Eventually we hooked up our mosquito nets and settled in to our wooden huts on stilts, which overlooked a lovely patch of dry deciduous forest, home to all the special animals we were hoping to find over the next few days. Understandably, not everyone was up at first light next day. 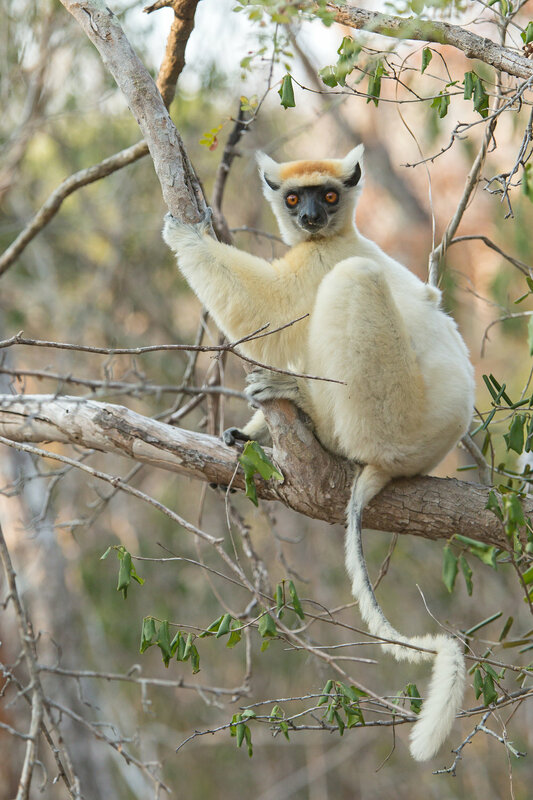 However, the Golden-crowned Sifakas were, taking the early morning sunshine in treetops not far from the camp and visible from our verandas. After a little figuring out which trail from the dry streambed would take us closer to them we enjoyed some very nice views in the low angle sunlight as they descended to feed. Fab-u-lous! There was a family of seven, one of which was a mum with a tiny 1-2 months old baby clinging to her side. There were a couple of other family groups further away in the forest that we could see from time to time and another family from the woodland behind the camp visited on one day. However, most of our encounters involved the streambed family. 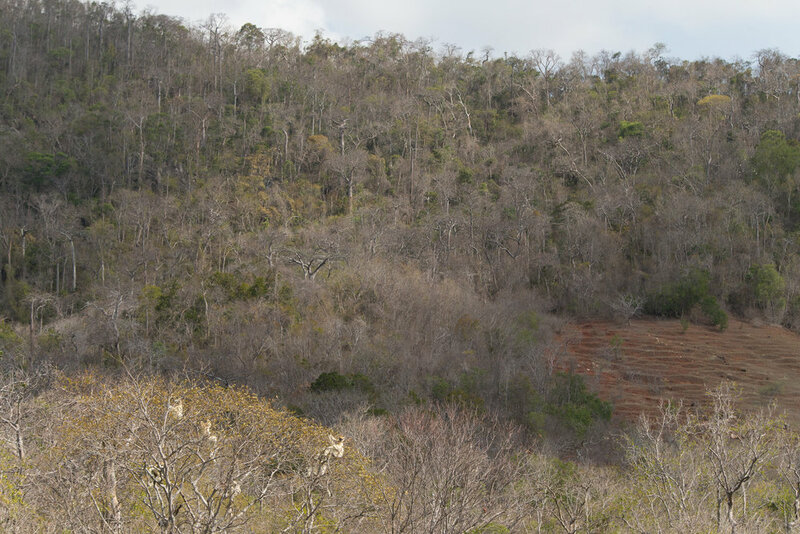 There were more evergreen trees in the bottom of the valley and this is probably the prime territory for the sifakas. Golden-crowned Sifaka is listed as critically endangered by IUCN owing to a declining, fragmented population and a very small range. It is only to be found in the Daraina region of northeast Madagascar. Another major attraction is that it is thought by many to be the most beautiful of all the lemurs but I guess that depends what your favourite colour is. We initially visited Daraina in the hope of seeing a naturally occurring Aye-aye but with two blanks now we have to simply regard it as a pilgrimage to see the sifaka. Well worth the effort in its own right in my opinion. The area in which Golden-crowned Sifaka is found is so remote that it was not described as a separate species until as recently as 1974! 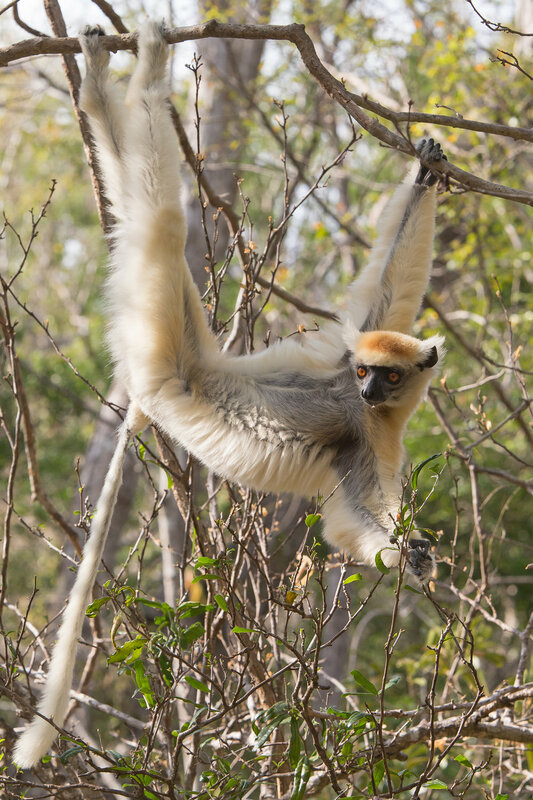 We counted a minimum of 27 sifakas during our stay and enjoyed several encounters with streambed family, which visited the trees adjacent to the camp each afternoon. 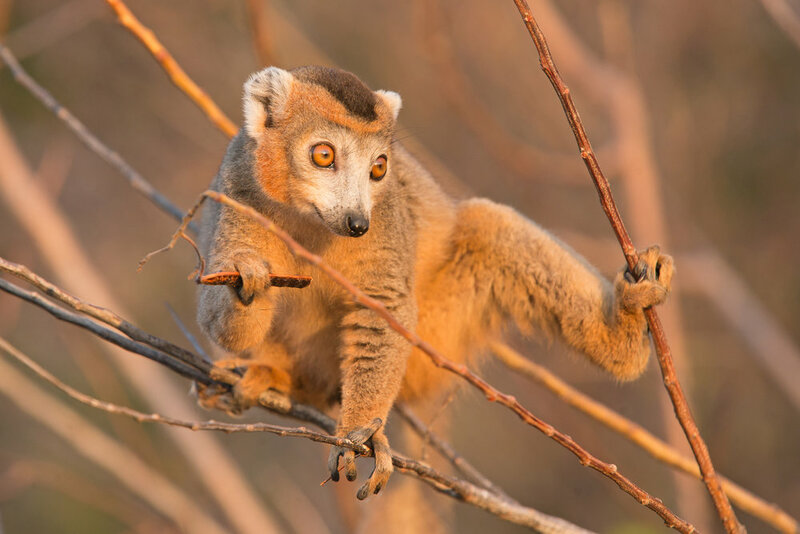 Recent studies have suggested that the formerly more extensive range of this lemur actually contracted before the appearance of man (the ‘anthropocene’), owing to drought events changing the forest landscape. Crowned Lemur is ‘merely’ endangered and occurs sympatrically with the sifakas in the dry deciduous forests of Daraina. There is also a family of this lovely lemur, which visits the camp each day to drink water, as well as to feed on the seeds of nearby bushes. It has a larger range, which extends to Ankarana and Mount Amber in the north. They were also very confiding and approachable making them ideal photo subjects with their incredibly sweet little facial expressions. 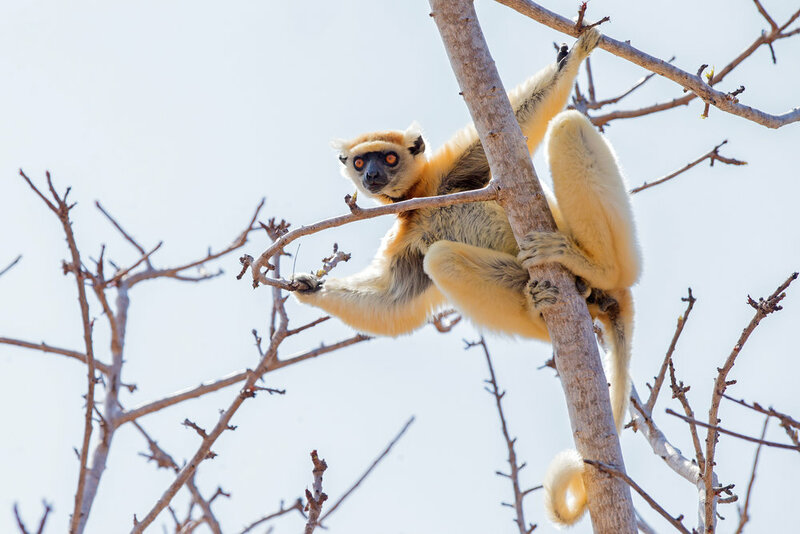 Like Golden-crowned Sifaka, its range is severely fragmented and they face numerous threats, the main ones being habitat loss to slash and burn agriculture as well as hunting for food and the pet trade. Recently the forest has been occupied by low-tech gold prospectors, who dig large pits that kill trees by undermining their roots. ‘Fanamby’ Fork-marked Lemur is potential new species of lemur, discovered in the forests of Daraina as recently as 2010. 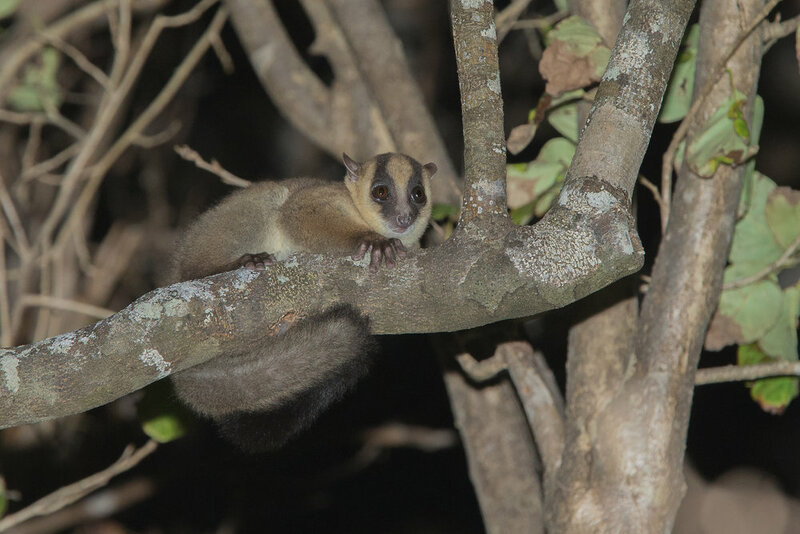 It occurs well outside the range of the four recognized forms of Fork-marked Lemur and will probably be named after the conservation NGO Fanamby, which has done much to protect remaining forest patches in this area. It will of course be instantly critically endangered. Fork-marked Lemurs’ diet consists mostly of tree gum rather than fruits. We could hear them calling in the forest surrounding the camp as soon as darkness fell and saw it in the spotlight a couple of times. Daraina Sportive Lemur is another product of the recent trend to split lemur forms off as separate species and like those above it is listed as endangered by IUCN. It is subject to the same threats as the other lemurs too. Happily it was easy to see by day as well as by night during our stay and also a little more than the usual ‘jack-in-the-box’ view typical of roosting sportive lemurs, with their feet ready for a quick getaway. Other interesting mammal species seen during our stay included Daraina Mouse Lemur and the introduced Common Palm Civet. Birds included Madagascar Harrier Hawk, which preys on small lemurs and its high-pitched screams could be heard regularly echoing across the forest. Madagascar Hoopoe could be seen regularly around our huts and both Rainforest Scops Owls and Madagascar Nightjars called around the camp when the sun went down. It is easy to dwell on the desperate plight of the last remnants of the lovely forest in the Daraina region and blame the various factors for its demise but the main purpose of this post is to encourage more folks to make the journey to Daraina and thereby contribute to their conservation. It is important that the forests have a value to local people via eco-tourism instead of the one-off income from slash and burn agriculture or timber. Stays at Daraina can be arranged via Fanamby here or on our new Northern Madagascar tour itinerary from 2020 onwards. Golden-crowned Sifakas at Tattersalli Camp, Daraina. When researching a new destination there is always something special that catches my eye. In the case of Madagascar it was undoubtedly Golden-crowned Sifaka. It is the cover star of Nick Garbutt’s ‘Mammals of Madagascar’ and is regarded by some to be the most beautiful of all the lemurs. After watching them feeding quietly close by in the late afternoon in their dry deciduous forest home at Daraina in remote northeast Madagascar I can't disagree. They positively glowed in the last golden rays of sunshine coming through the bare tree canopy. A mother with baby clinging to her side carefully smelled the forest floor, selecting nuts to eat, only a couple of metres away from me while the rest of her family group of five foraged nearby. The rest of the day they could often be found higher in the canopy, eating leaves and resting but this late afternoon descent seemed to be part of their daily routine. Golden-crowned Sifaka is a small and delicate indrid lemur and its appeal is enhanced by the fact that it is critically endangered. Only discovered as recently as 1974 by Ian Tattersall, it was finally described in 1988 and more recent genetic studies have established it as a separate species from the Verreaux’s group of western Sifakas. In fact it may actually be more closely related to the Diademed group instead. It has an incredibly small range and occurs only in the vicinity of Daraina where it faces a number of threats, all of them associated with the activities of man. Forest clearance for agriculture and fuel as well as gold mining is the biggest threat but they have also been hunted periodically for bush meat, particularly during the economic chaos that ensued after the 2009 coup d’état. 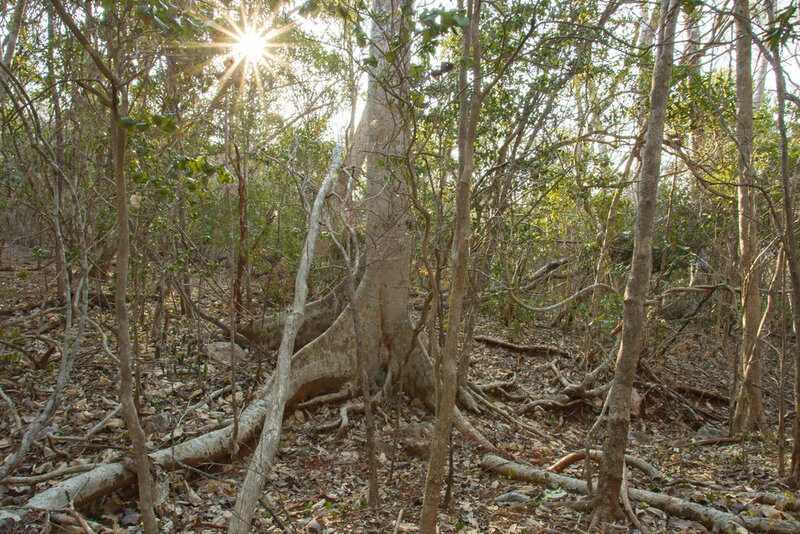 The recent influx of gold miners to the area has also damaged the forest itself, leaving deep pits everywhere, which undermine tree roots and ultimately kill them. 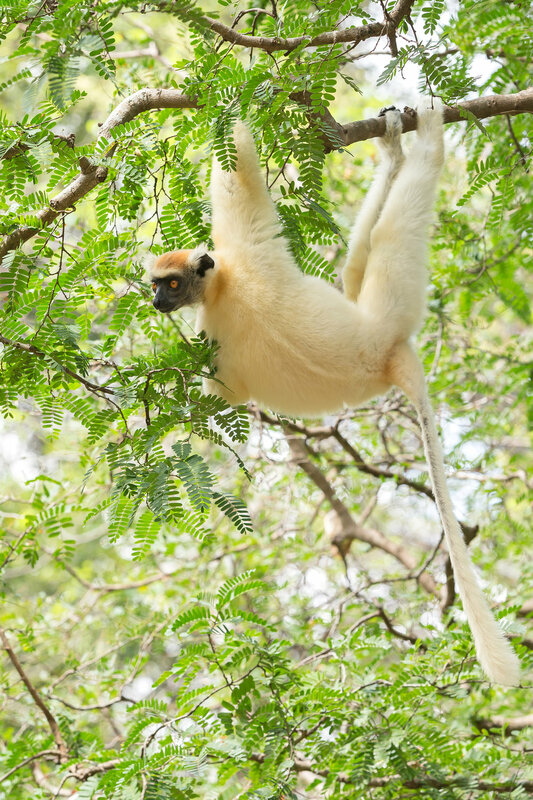 It is actually quite straightforward to see Golden-crowned Sifaka, they are common and easy to find in the forest patches around Daraina, although the road journey to get there, from whichever direction you approach, is something of an ordeal. In fact my friend Terry Chambers reminded me that it took longer to get from Antsirinana to Daraina by road than it did from Paris to Antananarivo! The road was not repaired after the last rainy season and is a nine hours bumpy ordeal each way from Antsirinana with not much to look at along the way in the rather degraded countryside. We didn’t see a single bird of any species for almost an hour after we set out from Antsirinana for instance. The Madagascar conservation NGO Fanamby has established an eco lodge at Daraina, Tattersalli Camp and although its wooden huts are very simple, it is clean and wonderfully located right on the edge of some really beautiful forest away from the gold digging areas. The sifaka (and also the merely endangered Crowned Lemur) can even be seen in the trees around the camp itself, including from the bathroom! The forest immediately adjacent to the camp had a couple of families of Golden-crowned Sifakas at the time of our visit and it also produced some interesting birds like spectacular Sickle-billed and Hook-billed Vangas. A large roost of Greater Vasa Parrots coming and going was another memorable sight (and sound). At night the forest comes to life and although we did not manage to find an Aye-aye this time, there were some signs of their feeding activity. Worryingly some dead Aye-ayes were found recently, by our guides, having been killed by locals who regard them as evil spirits and harbingers of death. We saw plenty of other lemurs, all of them unique to this area including Daraina Mouse Lemur, Daraina Sportive Lemur and the putative ‘Daraina’ Fork-marked Lemur. I am hoping that this post will encourage you to make a wildlife pilgrimage to Daraina and maybe help persuade the local people that the lemurs and their forest home here are worth more alive than dead. The long journey is well worthwhile and was one of the highlights of my recent visit to Madagascar. You can either join my next Wild Images tour to Madagascar or contact the NGO Fanamby directly. 'I believe I can fly! 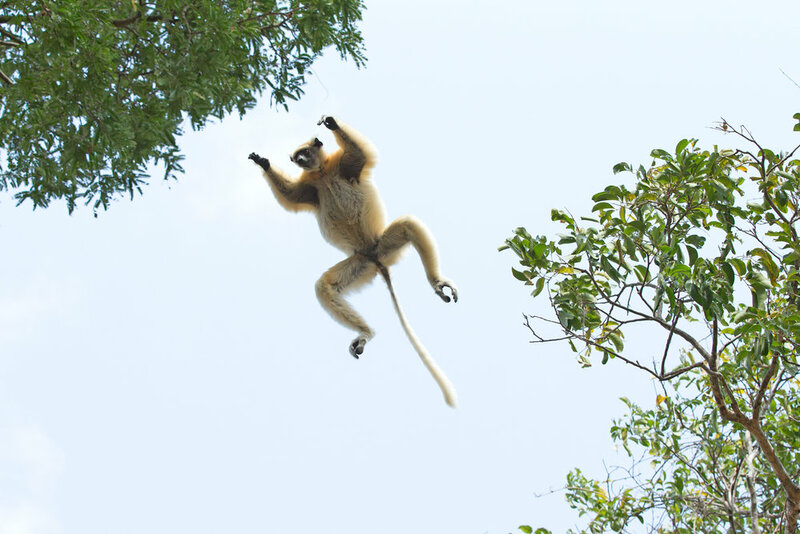 A Golden-crowned Sifaka takes to the air. Crowned Lemur, from the bathroom! 'Daraina" Fork-marked Lemur is sure to be another separate species of lemur. Late afternoon sun at Tattersalli Camp, Daraina. 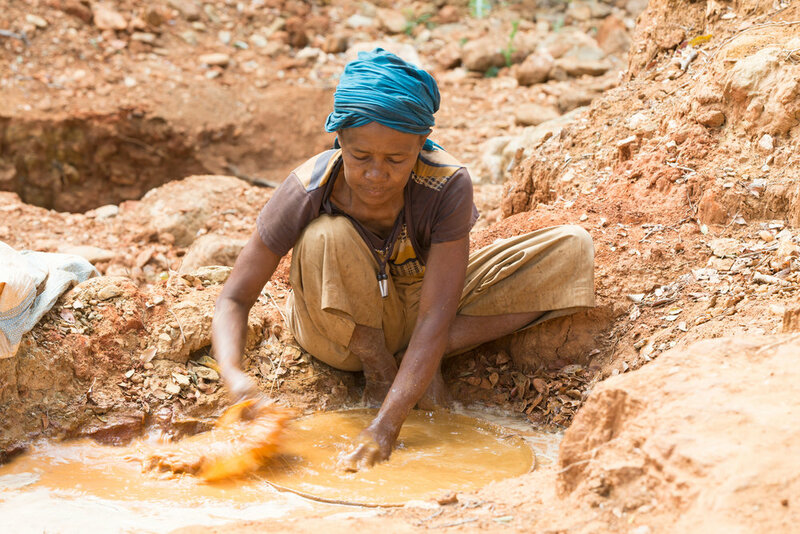 Panning for gold at Daraina, a hard life attempting to find some fragments of poor quality precious metal.